session of 2 x 20 minutes at your FTP (threshold). On the main interval set we give a suggested cadence which alternates each 5 minutes between high and low. This can be changed if you wanted and just ride each 20 minute interval at your own preferred cadence. Alternatively you can ride each 20 minute effort as a time trial following the ride data displayed of speed, power, cadence and gradient. Download features a dashboard on the top of the screen which shows suggested intensity RPE, heart rate and power zone along cadence and on-screen prompts to indicate change of pace and cadence. 1 hour 10 mins run time, download is in MP4 file format. 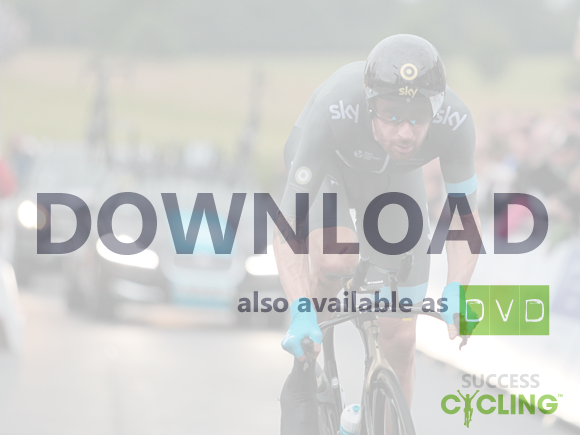 Download also features workout soundtrack to add to your training enjoyment. Bought this video for those indoor TT workouts. Brilliant!! Makes me feel I’m there keeping up in the first segment and then setting the pace in the second. Truth is, the speed and power the guy is putting out is beyond what I’ll ever achieve. I have been using it now for a couple of months and I believe it has improved my leg strength and stamina. It has become my favourite video for a Time Trial workout. I love the motivational speeches from (in particular) Ali and Arnold Schwartzenneger while warming up. And seeing all the pro teams with Wiggins etc warming up is very stimulating. The video of the 2 rides is rock steady and lovely quality. All in all it feels really classy, including the soundtracks. The actual rides are all done at a ‘constant’ effort band as you might expect for a time trial. I programmed two separate workouts, with the power ramping up a bit in the 2nd one so I had options of how to use the video. Superb!